Sold on a Monday by Kristina Morris is the story of reporter Ellis, secretary to the Chief of a newspaper Lily, and the mother and children that Ellis takes a photo of and places in the newspaper for a story, not exactly on purpose. The title says “2 Children for Sale”. He didn’t intend it to happen like that but it has. As a result two children are sold, a mother disappears and Ellis and Lily are left wondering. Lily has a secret of her own, and a desire to be a writer if only she can break through the male barrier to that. And she is the persevering kind. Ellis does make good from the story that goes with the photo, but… he is a man of conscience and so begins a journey that he and Lily undertake to ensure that the sold children are safe and thriving. What they find out disturbs them enough to have them undertake a sometimes quite dangerous mission to recover the children. The story is one that kept me engaged the whole way through. It was both sad and heartwarming and I really liked both the setting and the characters. Very satisfying. 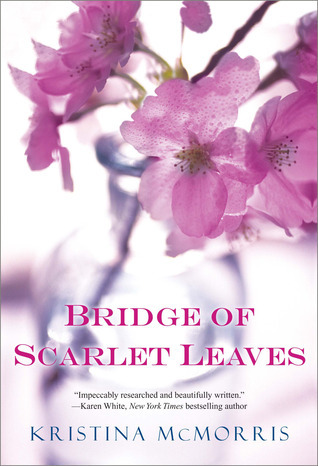 Bridge of Scarlet Leaves – my first book of the year – what a powerful read. I had read a picture book a number of years ago that told the story of how the Japanese immigrants – many of them citizens of America, were herded into camps in the U.S.A once the war broke out. So I was prepared but… Kristina McMorris’ thoroughly researched, extremely well written novel opened my eyes to this time in history. I know we are meant to learn from history and not repeat its mistakes. However I suspect those who need to, don’t read these kind of books. For I know the kind of indiscriminate decisions made then could be repeated now, in most or all countries of the world. However let us read and have our hearts and minds opened. I loved the story of Maddie – in love with Lane a son of a Japanese immigrant and a U.S. citizen. They kept their love hidden for quite awhile because of the opposition they knew they would meet. Lane was also the best friend of T.J. Maddie’s brother. T.J. took it on himself to be responsible for Maddie after their mother died and their father sunk into deep depression. T.J. would not look kindly on any relationship between Maddie and Lane. When the war against Japan starts all their lives are changed forever. Lane’s family are sent away, T.J joins up and Maddie is determined not to be separated from Lane and sets out to find him and be with him. I really don’t want to give any more away, only to say it is a deeply emotional and at times very hard story to read. War atrocities and the camp at Manzanar (where Lane’s family ended upt) were terrible. Yet there is powerful hope and a sense of the importance of life and living. I loved the exploration of the Japanese culture and the emphasis on how important it is to reach out to each other in forgiveness, peace and hope. I loved the way Maddie integrated with Lane’s family and the blossoming of Lane’s mother and their ultimate decisions. I also loved how the latest addition to the family reaches out and awakens someone who has long been sunken in grief. Many of the characters carry secrets, there are many twists and turns in the plot, and I don’t want to discuss too much because that would take away the pleasure from the reading for someone just taking up the book. It is a story of second chances, love, forgiveness and redemption. It is also about generosity and compassion. And for sure the seedier side of life shows through.